The Barton family in Scotland were a famous family of mariners and naval officers. About 1500, an Alexander Barton married a Susan Stedman who was the heiress of family land in Scotland. He petitioned Queen Mary of Scotland to assume the Stedman name, and he became Charles Stedman. All of the documented Scottish Stedman families who came to America are descended from this man. Most of the material on this page is derived from material in the Joseph Earle Steadman book and from Jean Christie who resides in Scotland. She graciously shared some of her materials with Wayne Hendon who, in turn, has shared them with me. Thank you Joseph, Jean, and Wayne! Adapted from: "Barton and Stedman also Steedman and Steadman Families"
The lineage shown in this page was documented in the so-called Barton-Stedman Menoir by John Stedman of Bath, County Somerset, England, and privately printed in 1857. The lineage was authentically proved and passed inspection by the British College of Arms. "Gules, annulets Or", meaning "a shield of red color with small rings of gold color depicted thereon". The lineage shown in the memoir mentions but few dates of birth and death for the persons named therein; however, each person is related to an event which pertained to himself. The following lineage shows only the line of descent from Radulphus (Ralph) de Barton, the first known ancestor, to Alexander Barton, who became Charles Stedman. Radulphus de Barton was living in County York, England during the reign of King Henry II (1154-1189). Thomas Barton was the younger of two sons. He was of Ainderby and Kirklington in County York. Between the 6th and 12th years of King John (1199-1216) he made a grant of land to the monks of Fontaines, whose celebrated abbey was situated at Rieval (or Riveaux) near Helmsley, in County York. The abbey was about twelve miles northeast of Ainderby. Thomas married Cecily _____ about 1195. They had two sons. She survived him. Sir William Barton, Knight, was the younger son of Thomas and Cecily Barton and resided at Steresby, County York, England. He was seized in those lands in 1236. He had three sons and a daughter. "Monsire de Barton port d'ermin, sur les fess gules, trois annulets d'or." He had three sons and died after 1310 in County York, England. Robert Barton was the youngest son of Sir John Barton. In 1315, Robert was the receiver and keeper of military stores in the District of Carlisle, County Cumberland, England. He married Margaret _____ and had two sons and a daughter. John Barton was the older son of Robert and Margaret Barton. John appears to have been in the confidence of King Edward III (1327-1377). He was a Burgess of Kingston on Hull River in County York, and, in 1334, he was collector of customs there. He also held various commissions for the defense of the kingdom between that period and 1338. He had two sons. Philip Baron was the older son of John Barton. In 1346, he was chancellor of Berwick on Tweed River in County Northumberland, England, where he died in 1347. He had one son and a daughter. Robert Barton was the son of Philip Barton. He was the Master of the Hospital at Saint Mary Magdalene at Berwick on Tweed River in County Northumberland, England, where he was living in 1344. He married Margaret _____ and had two sons. William Barton was the older son of Robert and Margaret Barton. In 1425, he was collector of customs at Kinghorne, County Fife, Scotland. (Chalmers in his History of Dunfermline, Scotland states that the County York Bartons came to Scotland after a contest with King Edward III. He had one son. Andrew Barton was the only son of William Barton. He was living at Leith, County Edinburgh, Scotland during the reigns of King James III (1460-1488) and King James IV (1488-1513). In 1505, he was distinguished from his grandson "Andrew Barton the younger". According to Item 3041 in The Register of the Privy Seal of Scotland, Vol. I (A. D. 1488 -1529), he married Margaret Prestoun. Andrew died before June 22, 1518 and left three sons. John Barton was the eldest son of Andrew and Margaret (Prestoun) Barton and born about 1440 at Leith, County Edinburgh, Scotland and was murdered while being held prisoner in 1476. During the reign of King James III (1460-1488), Captain John Barton was a celebrated Scotch naval officer and a merchant shipper of Leith, County Edinburgh, Scotland. He is mentioned in the 1474-1475 account of the Chamberlain of County Fife, Scotland, as master of the vessel "King's Carvel" (or the "Yellow Carvel"), which was plundered by the Portuguese. In 1476, he put out to sea from the Port of Sluys/Sluis (in Flanders - now part of Zeeland, Netherlands) with his ship "Juliana." The ship (laden with a very valuable cargo) was suddenly attacked by two armed Portuguese ships, one of which was commanded by Juan Vasques and the other by Juan Pret. Some of the crew of the Juliana were killed, many wounded and forced into slavery, while others were thrown into a fishing boat and set adrift, and the Juliana was carried in Lisbon, Portugal. It appears that John was among those who were set adrift. He proceeded to Lisbon to seek indemnity, and the affair was brought before the court of law. The court trifled with or evaded the matter, and as John persisted in pursuit of redress, he was murdered, with a view of putting an end to the affair. At some point during the period of 1460 to 1476, King James III gave to John Barton the gift of mariage (tenure of land and buildings, including a dwelling house). After John's death, the King gave the mariage to M. James Henrisoun (The Register of the Privy Seal of Scotland, Vol. I (A. D. 1488 - 1529), Item 3041). Andrew Barton was the eldest son of John Barton and was born about 1466 and was of Leith, County Edinburgh, Scotland. Like his grandfather, he was a famous Scottish naval officer. In August, 1511, Admiral Barton was killed during a great naval battle with the English. (c) The Bartons (Andrew, Robert, and John), like their shipmate and friend, Sir Andrew Wood, all obtained high honor and fame, though their origin was more distinguished than his, and they were long remembered among the fighting captains of Leith. The eldest brother, Andrew Barton, was an especial favorite of James IV who bestowed upon him the then coveted honor of Knighthood for "upholding the Scottish flag upon the seas". (Grant-Cassell's Old and New Edinburgh, Vol. III) Thereafter, he was known as Admiral Sir Andrew Barton. 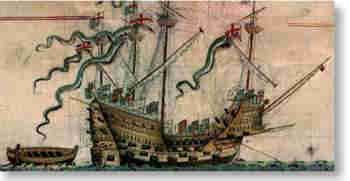 In 1497, Admiral Sir Andrew Barton furnished provisions for the "Lion" (a celebrated ship jointly owned by the Barton brothers), commanded by his brother Sir Robert Barton on the occasion of conveying Perkin Warbeck and his wife (styled the Duke and Duchess of York ) from the port of Ayr, in Scotland, to the continent. Perkin Warbeck was a pretender to the throne of England, and was hanged in 1499. Immediately after the seizure of John Barton's ship and the mistreatment of its crew, King James III complained by letter to the King of Portugal about the affair of 1476, and claimed compensation for the sons of John Barton. Minor satisfaction resulted from the complaint, and James III later decreed letters of marque (reprisal) against the Portuguese. However, in hope of redress by the Portuguese, the letters were being held in abeyance when the king died in 1488. James IV, his son and successor, then was an infant and the letters lay dormant until 1494. In that year, James IV granted new letters to the two younger sons (Robert and John, Jr.) of John Barton. These letters also were held in abeyance until renewed in 1505, authorizing the three sons (now including Sir Andrew) "to make reprisals on the Portuguese to an amount equal as the goods of which they had been plundered, and of which restitution was denied; and that wheresoever Andrew, or his brothers, or their assigns, should meet with or could seize any one or more Portuguese (ships), by sea or land, it should be lawful for then to do so, to the utmost of their power, forever, until satisfaction should be made, to an equal amount for the loss of the ship, and the destruction and plunder of all the goods which were on board and for the slaughter of the seaman and kinsmen of Andrew, and his brothers, to the number of seven men." In order to give these letters all possible publicity, James IV wrote to "all Kings, Princes, Potentates, and States on the Coast, to notify them that the Bartons, and their ships, were not to be deemed pirates, but such as had true letters of marque and reprisal from him." In 1563, all letters of marque granted to the three brothers and their successors were formally recalled by Mary Stuart, Queen of Scots (1542-1567). From Item 2175 in The Register of the Privy Seal of Scotland, Vol. I (1488-1529), it is learned that, in recognition of his deeds, on 2 January 1510, King James IV gave to Admiral Sir Andrew and his heirs the grant of an escheated estate consisting of the domicile and all lands of Ballinbreich, and the grant of advowson to the Chapel of Glenduky located on the said estate. The grant of advowson made Sir Andrew and his heirs responsible as patrons of the chapel, with the right to nominate someone as clergyman to serve the chapel. As part of their responsibility the patrons furnished a "church living" for the clergyman. On 16 October 1510, Ballinbreich was merged into the estate of Hall-Tacis (see below). Item 3511 of The Register of the Great Seal of Scotland, (1424-1513), shows that on 16 October 1510, at Edinburgh, King James IV granted to Andrew Barton and his son Alexander Barton the freehold estate of Hall-Tacis. This estate, created specifically for them, was formed by merging together the whole or parts of the lands of Tacis (including Hall-Tacis and Hill-Tacis), Ballinderaine, Heighame, Logy, Ballinbreich, Leslie, and Ballingall. The newly formed estate was situated partly in county Kinross and partly in County Fife. In 1557 Mary Stuart, Queen of Scots, confirmed "letters made by Alexander Barton selling the estate to John Pattersoun." Under the letters of marque granted to them in 1505, the Barton brothers put out to sea in merchant vessels of the largest type of those days. These vessels had low waists and very high poops and forecastles. Sir Andrew pursued his course with such vigor and success that even his name was a terror to the Portuguese. They were driven to the expedient of sending their goods to England in English ships, but this ruse did not defeat Sir Andrew in his purpose. He did not hesitate to attack such ships and seize the Portuguese goods found on board. The English merchants complained to the Kings Privy Council, who coldly received and rejected their complaint since Sir Andrew's acts were lawful under the authority granted by letters of marque. The Portuguese merchants likewise complained to their King who, on the plea of friendly alliance, demanded King Henry VIII of England to "clear the seas of Sir Andrew." Moved by such incitement, Lord Thomas Howard obtained permission of the English king to fit out two ships for the purpose. Lord Thomas and his brother Sir Edward Howard were appointed to command the ships. This meeting occurred on August 2, 1511, and immediately resulted in a long and bitterly fought conflict in which Sir Andrew was wounded. Even so, he continued to encourage his crew until he received a cannon ball in his body and fell dead upon the deck. His ships were immediately boarded and carried into the Thames River. After a short imprisonment the crews were dismissed, but the ships were retained as prizes. The "Lion" was placed in the English navy as the second ship of war. This conflict between Sir Andrew and the Howard brothers is commemorated by English poets, from their point of view, in "The Ballad of Sir Andrew Barton" (included in Percy's Reliques of Ancient English Poetry) and in "Sir Andrew Barton" (included in Naval Songs and Ballads). The conflict eventually led to the Battle of Flodden Field, which was fought in February 1514 between the armies of James IV of Scotland and Henry VIII of England. Though these two kings were brothers-in-law they held intense hatred and contempt for each other. "Gules three shell snails Or." Alexander Barton was the only son of Admiral Sir Andrew Barton. Alexander and many of his descendants married young and lived long lives. About 1509, he married Susan Stedman (who died in 1565) an heiress, daughter of Charles and Janet (Neilson) Stedman of Leith. When Susan's father died, Alexander added a fess, instead of an escutcheon, to the shield for distinction between Barton and Stedman. He and his father were granted in 1510 the freehold estate of Hall-Tacis. Alexander sold this in 1557. About 1540, during the reign of King James V (1513-1542) of Scotland, he was appointed Burgess of Edinburgh for life, Deputy Collector of Edinburgh, and Searcher of Merchandise on the shore of Leith. His son John Barton was given similar appointment with and succeeding his father (The Register of the Privy Seal of Scotland, Vol. II, A. D. 1529-1542). On the death of Susan (Stedman) Barton in 1565, Alexander applied to Queen Mary (1542-1567) of Scotland and was granted "arms of adoption" by which he was empowered to obtain the estate bequeathed to his wife by her father, on the condition that he assume the name and arms of the deceased father. (Burke, The General Armory, p. XI) Alexander Barton thus became "Charles Stedman."